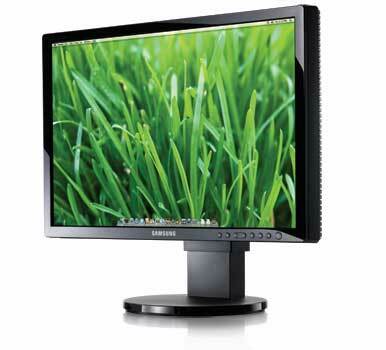 The Samsung SyncMaster 245T is a 24-inch LCD with multiple inputs and a flexible design. And though washed out at default settings, a little tweaking helped the 245T score well in our on-screen tests. With an anti-glare screen, the 245T has a thin, shiny, black bezel with clearly marked buttons right on the front, right bottom of the screen. There are many connection options to choose from, including DVI, HDMI, Component, VGA and S-Video. The 245T supports picture-in-picture and a technology called Motion Picture Acceleration (MPA) that is supposed to improve movie viewing on the display. The monitor also sports a built-in four port USB 2.0 hub. When we connected the display to a 2.66GHz Mac Pro, it booted into its correct, native 1,920-by1,200 resolution. Unfortunately, the display was overly bright, whites had a bluish tint, and blacks looking gray. Using our Eye-One Display calibrator, we were able to get the monitor looking much better. Even without a calibrator, simply going into OS X’s Display Preferences and choosing Adobe RGB from the Color menu helped immensely. Once calibrated, text was sharp and legible, even at tiny point sizes. Our standard color test photo looked great, with bright and pleasing colors, and there was no drastic color shifts when looking at the screen from the sides, only a gradual loss of contrast. The 245T’s 6ms pixel response time should be fast enough for gaming and keeping up with fast-moving action movie scenes. We didn’t see any problems in our testing, and we were also not able to notice any difference between the scenes with Motion Picture Acceleration active and inactive. Despite its washed out default settings, the SyncMaster 245T, after calibration was a very good all around performer. Its wealth of input options, flexible stand and its sleek, black design make it a good fit for those looking for a monitor that can handle both clean, legible text documents as well as the latest Hollywood blockbuster.